Newton’s Second Law of Motion states that acceleration is produced when a force acts on a mass. The greater the mass of the object, the greater the amount of force needed to accelerate the object. 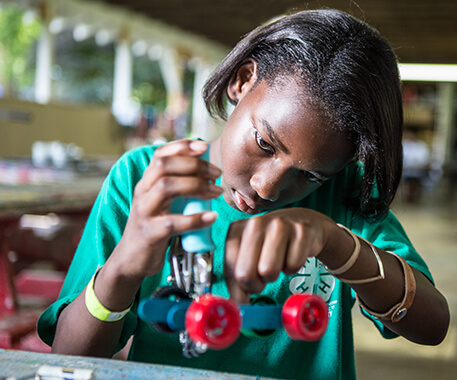 This 4‑H STEM Lab activity uses Hot Wheels cars to explore the concepts of acceleration, mass and force described by Newton. Youth will explore how the weight of a car affects how far it will travel in the air off a jump. Take your two Hot Wheels cars and select which car will be Car 1 and which will be Car 2. This will help you when recording your data. Connect the launcher to two pieces of track and the first part of the jump ramp. (An additional segment of track and books can be used to create a ramp). Launch Car 1 using the first launch setting and mark where the car landed with a piece of masking tape labeled 1-1. Launch Car 1 using the second launch setting and mark where the car landed with a piece of masking tape labeled 1-2. Launch Car 1 using the third launch setting and mark where the car landed with a piece of masking tape labeled 1-3. Finally, launch Car 1 using the fourth launch setting and mark where the car landed with a piece of masking tape labeled 1-4. Measure the distance from the end of the ramp to each landing mark and record it in the STEM Lab notebook. Launch Car 2 using the first launch setting and mark where the car landed with a piece of masking tape labeled 2-1. Launch Car 2 using the second launch setting and mark where the car landed with a piece of masking tape labeled 2-2. Launch Car 2 using the third launch setting and mark where the car landed with a piece of masking tape labeled 2-3. Finally, launch Car 2 using the fourth launch setting and mark where the car landed with a piece of masking tape labeled 2-4. Challenge kids to create their own experiment to test acceleration, mass and force. Would the length of the track affect the results? Re-run the experiment with a shorter or longer track. Are the cars really traveling at different speeds (acceleration)? Run a new experiment with a launcher connected to four track pieces and time how long it takes to get from the first to the last piece of track. What accelerated the cars down the track? How did the weight of the car affect the distance it was able to jump? Did Car 1 and Car 2 ever land close to each other? If so, what were the launch settings for each car? Physics is the science that deals with matter, energy, motion and force. The studies of sound, electricity, motion and heat all involve physics. One of the most famous physicists was Sir Isaac Newton. He is best known for discovering gravity by watching an apple drop, but he also created the three laws of motion. Newton’s Second Law states that acceleration is produced when a force acts on a mass. The greater the mass of the object, the greater the amount of force needed to accelerate the object. Force can be defined as a push or a pull, which gives energy to an object and causes a change in the motion of that object. Mass is the weight of an object and acceleration is the rate of change in the object’s speed. In the activity, the lighter car took less force to accelerate down the rack and off the ramp. The heavy car was not able to reach the same speed as the lighter car, even when the same force (launch setting) was applied, which caused it to be pulled to the ground by gravity sooner after it exited the ramp. Download and print the Newton's Speedway: Acceleration, Mass, and Force PDF to easily complete the activity in groups.